Back-to-school time??? Wow! It seemed so far away in May. Now, the summer has flown by and, the first day of school is just around the corner! Getting everything done can be very overwhelming whether you’re a new teacher, almost new, or not new at all. Not only can students have the jitters on the first day back-to-school, but so can we. 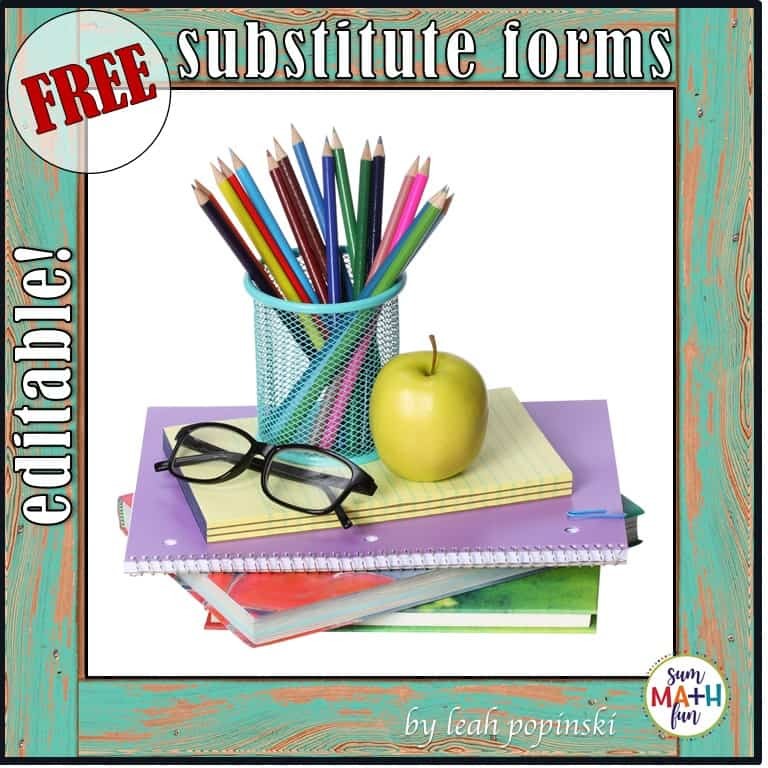 If you’re looking for a back to school printable, just click this link. Did I get it all finished? Is everything ready and accessible? Do I know what the plan for my day is? Have I thought of all the what-ifs? 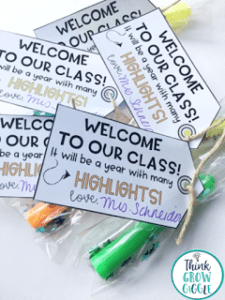 Having a cute and cheery student gift on each desk as students enter their new classroom can truly help relieve the jitters and get everyone off to a great start. 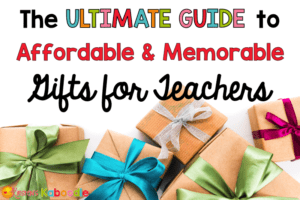 With the help of some super teacher friends, I’ve rounded up some ideas that are easy and fast and cheap to help you have that perfect student gift ready to go and on their desks when that first student – or parent – enters your door. Many districts have rules that don’t allow teachers to give candy/food to students. This first group of student welcome back gifts are non-food gifts that meet those restrictions and are still creative and super cute! A Year With Many Highlights – Think Grow Giggle has these welcome gifts for students ready for their arrival! She also has a wonderful checklist to help us not forget something for our Meet the Teacher Nights. The district Jeanine works in has a no candy or food policy. So her cute highlighter idea ties in well with school supplies. She also has some free Welcome Back School Awards. Make sure to check out all of Think Grow Giggle’s back to school ideas right here. 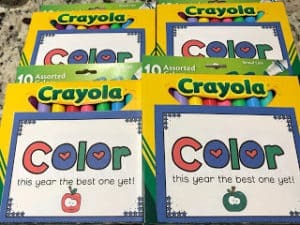 Color Your Year Your Best One Yet – This cute idea will also work well as a teacher gift for your teammates! You can tape the tag to crayons, colored pencils, or markers for another creative non-food gift idea. You can find this free gift tag at Believe to Achieve. 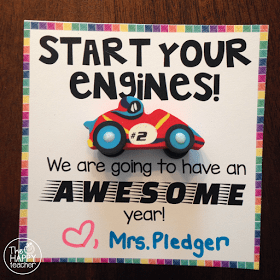 Start Your Engines – This is another great option if your district has a no candy or food policy. The Happy Teacher found these cute erasers at the Dollar Spot at Target. Since that might be hit or miss, I searched Amazon for “car erasers” not sure what I’d find. And there they were. Quite a few choices with delivery either “two day”, or “tomorrow”. Liz also has some really cute gift ideas for Meet the Teacher Night. 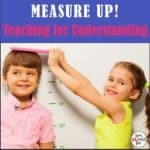 You can see her many ideas and get her helpful tips at The Happy Teacher. 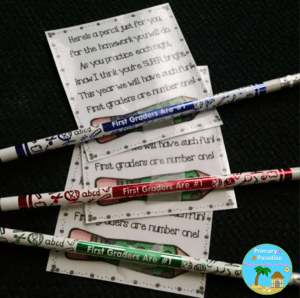 First Graders are Number One – Martha at Primary Paradise has this cute free idea for you. 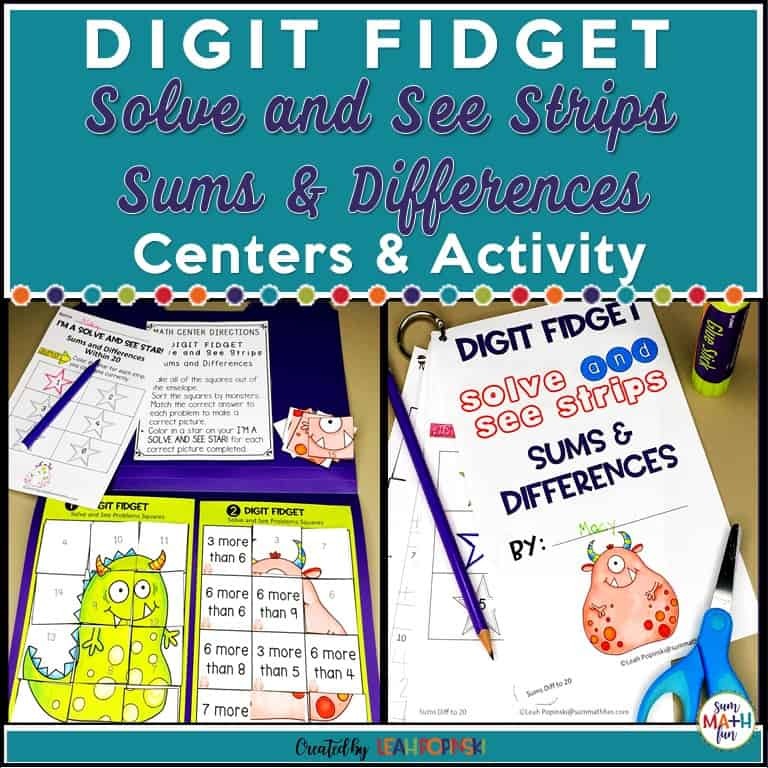 She loves welcoming her students with a gift that’s inexpensive, useful and easy to have ready-to-go. This cute poem with an appropriate pencil is definitely “number one!” It’s also a non-food item and would work for those who have regulations about giving candy or other food to students. Welcome Bach – So creative! If you’re a music teacher, you have to check out this tag that can be used for many different student gifts. 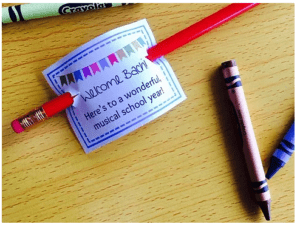 You can find this free tag on Teaching Wise’s blog post-FREE Back to School Gift Tags for Music Class! 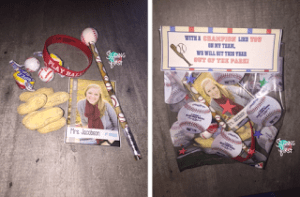 Hit This Year Out of The Park – Sliding Into First has these cute free tags plus many more ideas and freebies for student gift ideas. She has non-food ideas like bubbles and a baseball theme plus other free tags for Star Bursts and Smarties! You can check out all of her ideas on her Sliding Into First blog. 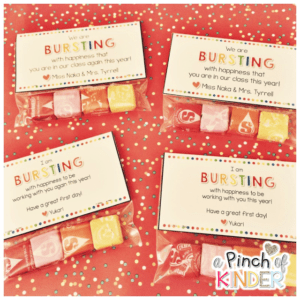 Bursting with Happiness – These bright tags attached to a baggie with a few Starbursts will be super cute waiting on students’ desks to welcome them. You can find these free tags at a Pinch of Kinder. 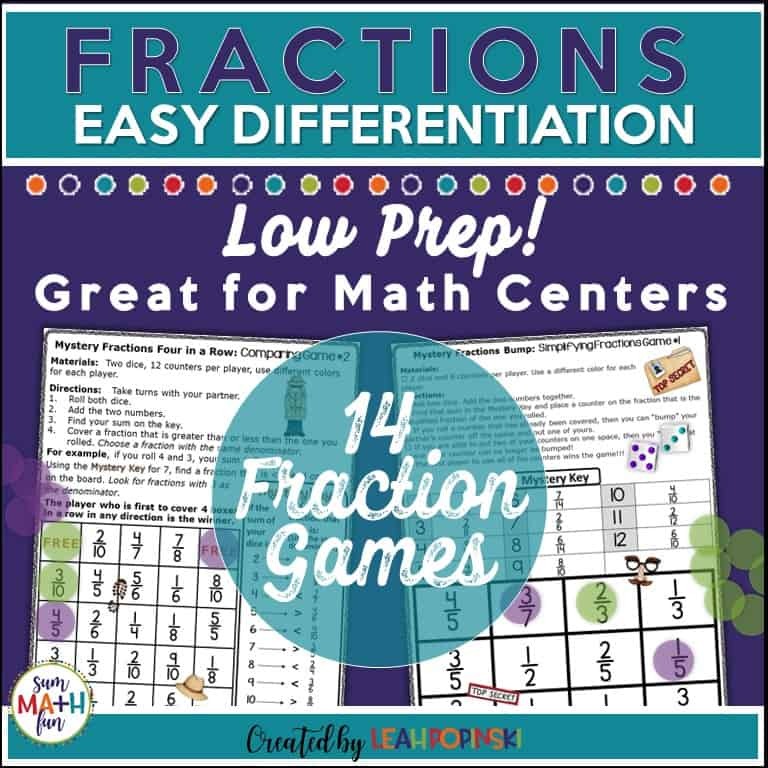 Yukari is happy to share her creations with you and help you get ready for back-to-school. 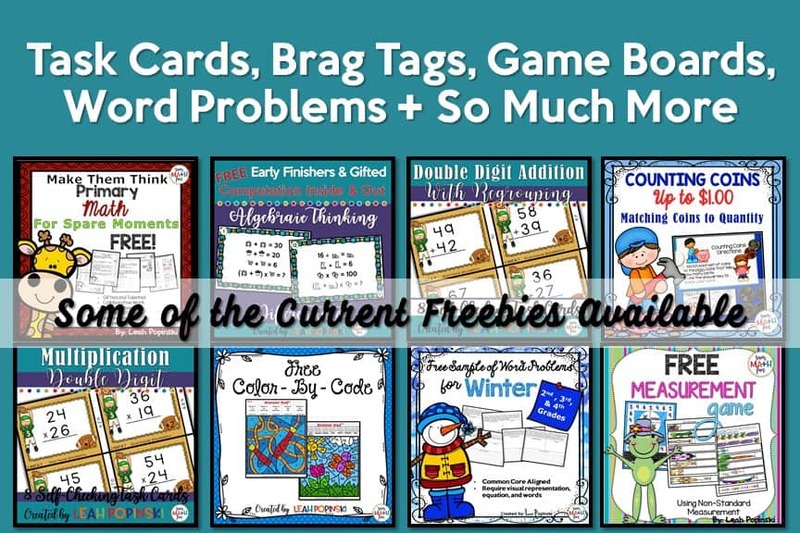 You are o’FISHally in Third Grade – You can find these free tags for all grade levels here at Sum Math Fun in the blog post “Free and Easy Back-to-School Student Gift”. And…here are even sum more ideas to help make your back-to-school adventure easier and more fun! 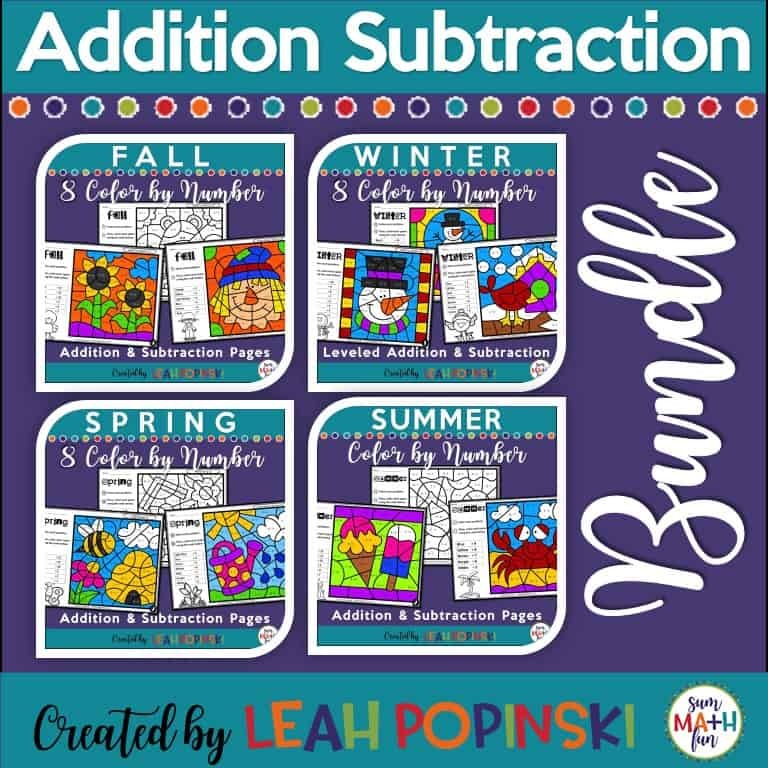 WE love back-to-school gifts, too! It just feels good to know others are thinking about us and want to take care of us as we embark on another year of our teacher journey! 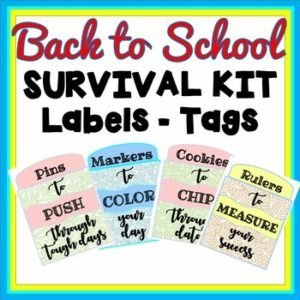 Survival Kit – Over 40 Back to School Teacher tags/labels to customize your very own goodie bag of supplies for new teachers! Or just to let a teammate know you are thinking about them. Just choose which label you want and make your very own welcome back bag. I really love the “Pins to Push Through the Tough Times”. We all need those! You can use these throughout the year to build community and add a little pick-me-up to someone’s day. Get all 40 tags for $4.00 at Think Tank. And there you have it! Some really wonderful ideas that are creative, cute, and inexpensive for back-to-school treats. 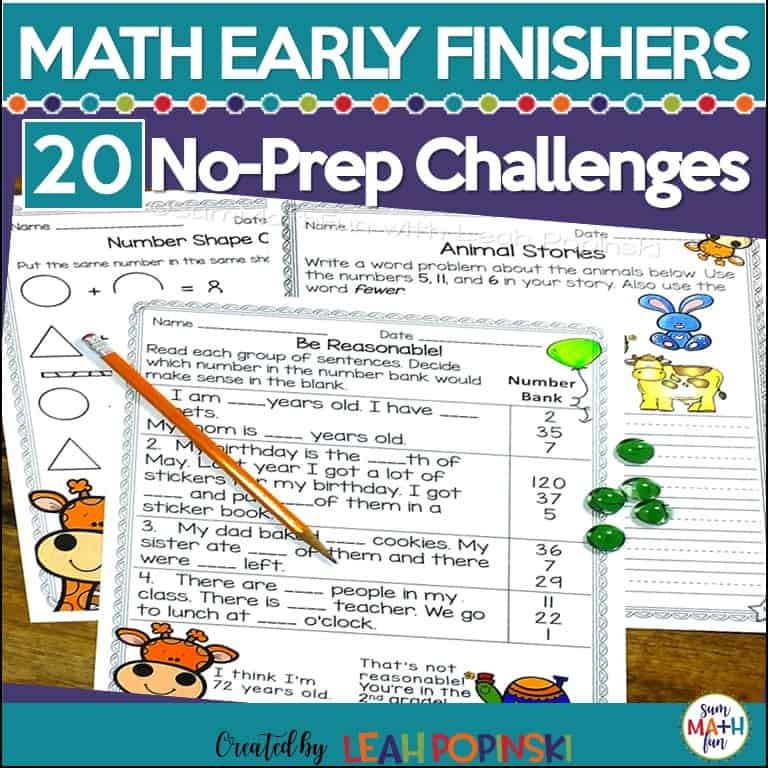 They are easy and quick to pull together so they don’t add to the back-to-school chaos. We’d love to know which one you used and how it worked out. Just comment below and let us know! 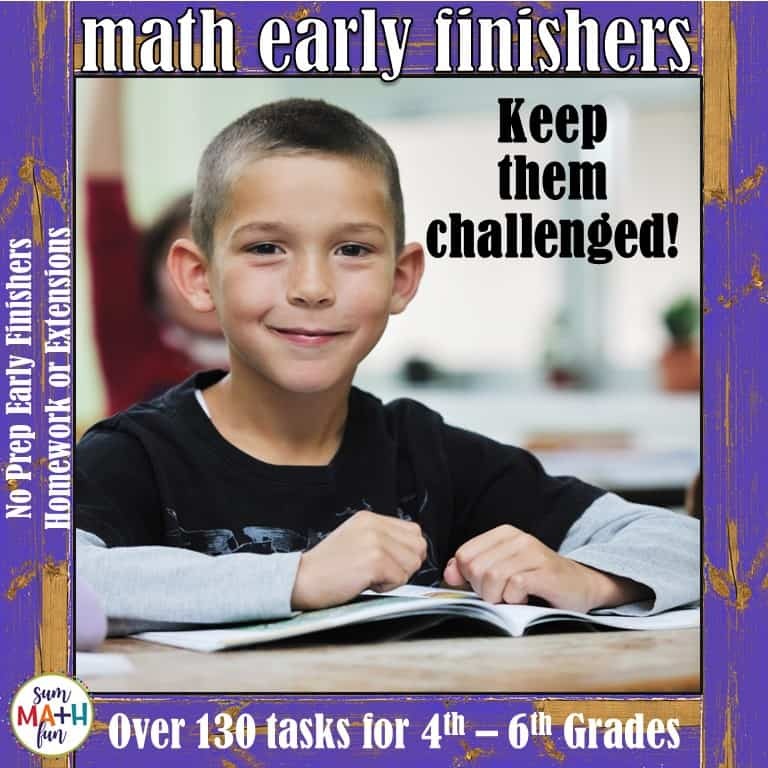 We’d truly be thrilled to see our resources in your kids’ hands! Wishing each of you your best year ever!